Acai berry supplements are proposed to have benefits for obesity, arthritis, high cholesterol, ED (erectile dysfunction) and more. Euterpe oleracea palm trees produce acai (“ah-sigh-ee”) berries. This berry is widely claimed to be a superfood, and there is no doubt that it does offer an excellent nutritional profile. Berries from acai palms have concentrated amounts of antioxidant compounds, fiber and heart-healthy fats. They are a rich source of anthocyanins, plant sterols and polyphenolic compounds. This article will review what researchers have discovered about acai berry constituents, uses, health benefits and safety. Side effects and interactions will also be discussed. According to Rainforest Alliance, Euterpe oleracea is found throughout the northern region of South America, and most of Central America. Acai berries measure about half an inch in diameter. When they first emerge, they are green, but then turn dark purple/brown as they ripen between July and December. Beverages are made with acai berry by pressing the juices from them. The fruit pulp leftover is used for dye making, and as a natural cosmetic. NMCD states that acai berry is eaten raw in whole form, or juiced. Acai berry juice is also incorporated into ice cream, liquor and jelly. Acai berry is also used in food manufacturing as a colorant. The Mayo Clinic states that acai berries might contain more antioxidant compounds than other commonly-eaten berries – like strawberries, blueberries and cranberries. NMCD states that acai berry contains high amounts of anthocyanins, which are polyphenols that yield the fruit’s deep purple color. Research has shown that Brazilian acai berry contains more of these beneficial anthocyanins than acai berries grown in the US. The bioactive plant chemicals in acai berry work together to induce a range of pharmacological effects. These are described in the following sections. In one human study, twice-daily consumption of Sambazon® Acai Smoothie Pack reduced both LDL-C (low density lipoprotein cholesterol), and total cholesterol. In-vitro studies using HL-60 human leukemia cells, 0.17-10.7mcM polyphenolic fractions from frozen acai berry pulp dose-and-time-dependently suppressed proliferation (rapid replication). It is important to note that there is a big difference between results obtained in cell culture studies compared to results obtained in human studies. Before determining whether acai extract has potential benefits for the prevention and treatment of cancer in humans, significantly more research needs to be conducted. There is insufficient evidence from double-blind placebo-controlled clinical studies to make any determinations about how this supplement might affect cancer in humans. More evidence is needed from clinical trials to determine if and how acai berry is actually beneficial for any health condition. Human research is lacking for this supplement. These uses of acai berry are not based on clinical evidence, but rather animal research and laboratory studies. You should discuss the use of this natural supplement with your doctor before beginning. Acai berry is often said to taste like a cross between berries and chocolate. Dr. Group suggests always buying acai berry that has been certified organic. Organic produce is safer because it lacks harmful chemicals used in commercial farming. Acai supplement products should be kept dry and cool in an airtight container placed in a dark location. Fresh acai berry should be consumed as quickly as possible to limit nutrient loss due to oxidation. There is insufficient available evidence to recommend any dosage of acai berry in children. Usage is not recommended in people under 18 years of age until more is understood about the safety of long-term use. There are no well-known standardized formulations of acai. Closely follow dosing instructions on an acai product you may purchase, unless otherwise instructed by your healthcare provider. NMCD states that using a specific acai product for one month did not cause any adverse side effects in one study. No toxic effects were noted in laboratory animals with doses as high as 2000 mg/kg bodyweight. That would be roughly equivalent to a 150-pound human consumption of 140 grams in a single setting. NMCD does not report any interactions between acai berry and foods, herbs, supplements or prescription drugs. Mayo Clinic states that you should let your doctor know about using acai supplements if you are scheduled for a MRI (magnetic resonance imaging) test. High doses of acai could cause false results. OVERVIEW: Acai berries come from the acai palm tree, a tree that is native to Central and South America. Acai berries have traditionally been used to make medicine, and are touted as a "superfood" with anti-aging and weight loss properties. 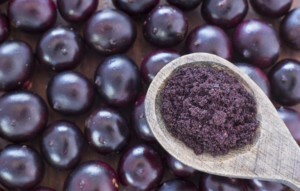 MECHANISM: The anthocyanins in acai have antioxidant effects that have been seen in humans. In human trials, acai has also been shown to have anticancer, anti-diabetic, and cholesterol lowering effects. DOSAGE: Common dosage is 1000 mg, once or twice daily, with food; follow manufacturer's dosing instructions. SIDE EFFECTS: Rated as Possibly Safe when used orally and appropriately in the short term. Information on adverse effects is lacking. May cause allergic reaction in sensitive individuals with allergies to other berries such as Elderberry, Goji berry, Schisandra berry, or grapes. RELATED SUPPLEMENTS: Pycnogenol, Green Tea, Grape Seed Extract, Dandelion Root, Astaxanthin.